Missionaries first came to this area in 1968 to translate the Bible into the previously unwritten local language. In 1979 Shirley Killosky traveled to Hauna Village as a literary specialist and teacher. After the translation of the New Testament was finished in 1989 by her sister, Shirley joined Kids Alive to continue the teaching program on the Upper Sepik River and to provide other remote villages with an educational program. Today, the Kids Alive ministry in Hauna Village has a large mission house where meetings are conducted, a school, church and several other buildings house a variety of activities and vocational training, including sewing, carpentry, stores, laundry and a mechanic shop. Over 700 students attending Kids Alive schools, both in Hauna Village and other remote villages, receive a basic education, learn three languages, the Bible and training in Christian discipleship. Because of the high rate of malnutrition and poverty in this area, the mission provides a nutritional meal to these students during the school day. A total of about 5,000 people receive assistance of some kind through the ministries of Kids Alive in the Upper Sepik River area. 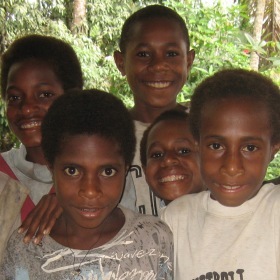 Support the Ministry of Sepik Christian Ministries with Your Gift Today.